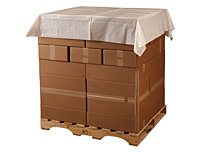 To keep your products clean and free of dust and dirt during shipping and storage, Poly Bag Central offers pallet top poly sheeting in an array of sizes and strengths. Stock items ship within 24 hours. For sheeting, liners, and pallet top covers not listed, call us for a custom quote. Poly Bag Central offers clear and white poly sheeting for palletizing your products. Keep pallet tops clean and dry during shipping and storage with our clear poly sheeting on perforated rolls that come in 1.5 mil and 2 mil gauges. The white poly sheeting comes in a 2 mil gauge and unfolds to reveal a 60 inch by 60 inch cover. Manufactured of low and linear low density polyethylene blend, the perforated rolls allow for easy dispensing. When you want more complete coverage and protection from the sun, use Poly Bag Central’s black UVI/UVA pallet top covers. Available in several sizes in 2 and 3 mil gauges. Pallet covers come perforated on a roll that surrounds a 3 inch diameter core with a 1 inch core plug. They are manufactured of 100 percent virgin low and linear low density polyethylene and are perforated for easy dispensing from a roll with a 3 inch diameter core. For clear pallet top covers, see our numerous sizes of 1.5 mil, 2 mil, 3 mil and 4 mil gusseted bags on a roll.